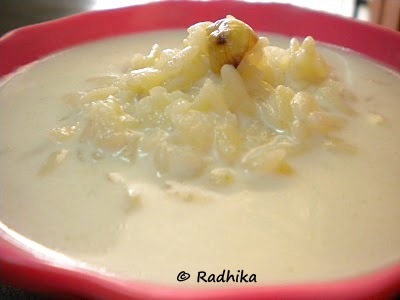 Aval Payasam was this Friday’s prasadham. I was planning to make Akkara vadisil but as usual as I was running out of time I had to opt for this. But Hoping to make it on Ugadi. Roast the cashew nuts in 1 tsp of ghee in a kadai. Keep it aside. In the remaining roast the aval over medium flame till it changes to light brown. Cool and keep 2 tbsp aside. Powder the remaining aval coarsely in a mixer. In a vessel heat 1 cup of milk and bring it to a boil. Add the powdered aval and roasted whole aval that you have kept aside and cook for 2 minutes. You can see that the aval has absorbed most of the milk. Now add the sugar, remaining milk, condensed milk, cardamom, roasted cashew and bring to a boil. 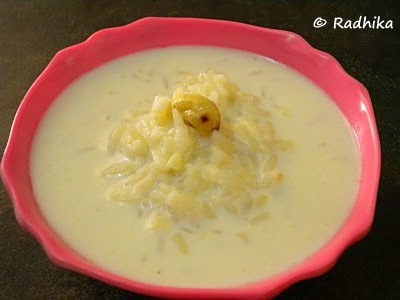 Kheer is ready. As Aval is a very thirsty fellow it absorbs all the liquid when kept for longer time. So serve it hot and immediately.